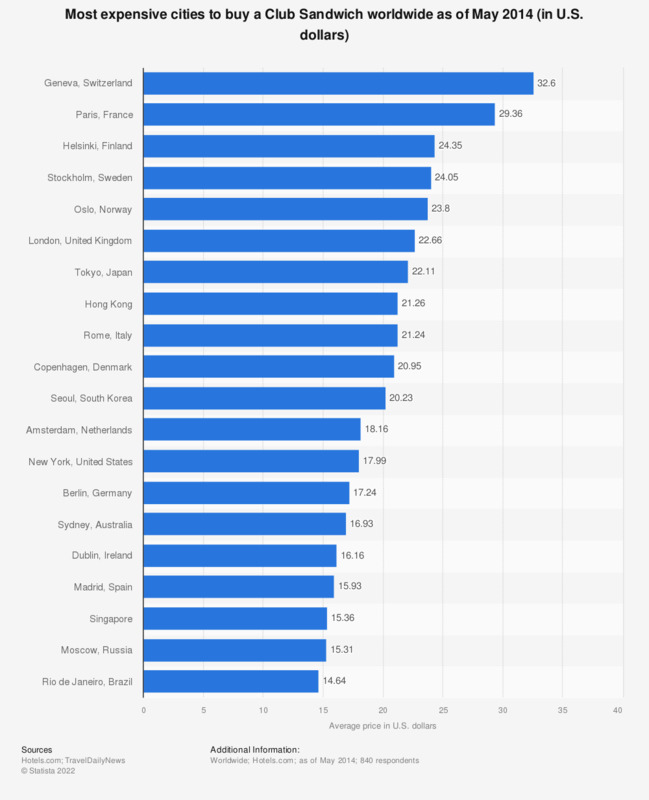 This statistic shows the most expensive cities to buy a Club Sandwich worldwide as of May 2014. In 2014, Geneva, Switzerland was the most expensive city in the world to buy a Club Sandwich with an average price of 32.6 U.S. dollars. The source does not specify a date of survey. The date of survey provided is the publication date. The figures for the Club Sandwich Index (CSI) were calculated by taking the average of real prices paid by customers for a club sandwich in 30 hotels in either the capital or a top tourist city in 28 countries worldwide. The hotels belonged to five, four, and three-star categories.